Keeping baby safe is the top priority when it comes to baby-proofing, but that doesn’t mean you can’t safeguard with style. Today’s Grommet combines the science of baby-proofing with the art of thoughtful design. The creator is Vianka Perez Belyea, who was underwhelmed by the baby-proofing products available when her infant daughter Soledad (now 3) started crawling. Vianka teamed with Tavinder Phull, and the two co-founded Rhoost to create their own functional, stylish baby-proofing solutions. 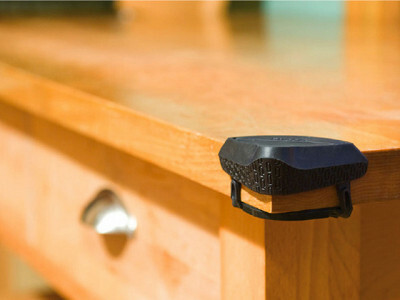 Rhoost’s Decoy outlet covers do their job keeping little fingers away from electrical outlets. Plus they have a notched groove on the back that’s just the right size for the prong of a plug. You slip the prong into the recess, twist, and the plug cover pops off. Presto, no ruined fingernails. We also love that there are no screws required for Rhoost’s Sling cabinet locks and no adhesives used with its impact-absorbing Edge corner protectors, so your cabinets and furniture won’t suffer any long-term baby-proofing damage. The whole line is easy to install and a breeze to relocate if you want to bring it along on a visit or vacation. That’s what won over Liz Meagher, who told us about Rhoost (she also discovered Tank Nanny, another clever safety device). Safety doesn’t have to be an eyesore! Hello Daily Grommet friends! I’m Vianka Perez Belyea, mother of a very feisty 3 1/2 year old and co-founder of Rhoost, a company that makes functional, stylish, non-toxic and eco-friendly childproofing products. And if you’ve ever almost thrown your back out lugging a coffee table out of sight in order to avoid using one of those awful sticky foam doohickeys – we have a lot in common! Lora: Give kudos to your husband for being creative! We've had a number of parents who are doing the same thing. Thanks for sharing! It's amazing to see the businesses that crop up out of parenthood! It seems that new parents, experiencing everything for the first time, have a sharpened sense of what is working and what isn't. Vianka, do you have any big learnings from starting your own business, something that you didn't realize at the beginning? Do you have any advice for those others out there who have a product idea and want to see it through to reality? Kudos on a great product! So great to see an eco-friendly option for child proofing! Keeping our kids safe in more than just one way. @Amy Burba: Thank you - It has been so helpful to get feedback from parents! This looks like a great line of products! And if my 2 1/2 yr old son is any indication of how devilish my now-four month old twin sons will be, I'm certain they'll come in handy!! As jeanne suggested, I'll order them now to be sure I have them on-hand later! Thanks DG! @Christine Lucy: You will be quite pleased with how easy it is to install and uninstall. The best part is that you can drop off the kids & Rhoost products at grandma's house.. to do something fun I hope! We're expecting a baby any day now... definitely have to stock up on these. So psyched I don't have to banish my favorite modern furniture. @Ryan F: So nice that you came across us & Daily Grommet before having the baby. CONGRATS - Being a parent is one of the hardest and most rewarding work you will ever do! Rhoost products have become a fast favorite with my friends. The sleek, modern look is what drew them in, but the fact that they can remove the products easily and take them to their parents' homes for last minute babysitting help really won them over! @Jill: Thanks for the feedback Jill! Our products are for parents and anyone who is around kids. That's a lot of people if you ask me. Thanks for spreading the word! Don't wait until the last minute to baby-proof - kids are smart and are very aware of their surroundings. If you baby-proof before they start crawling, it will be an easier transition for not just the caretaker but also the child. Now you have a solution that combines safety and decor.. yeah, that's us! Thank you for your comments and joining me today. I was just in touch with Vianka and she mentioned something that I thought would be great to share. The number one feedback that she hears (and it was a surprise to her) was that people feel comfortable bringing these with to their friends' houses because they provide protection, are quick to install, won't damage anything, and look great! Keeping baby safe is the top priority when it comes to baby-proofing, but that doesn’t mean you can’t safeguard with style. Today’s Grommet combines the science of baby-proofing with the art of thoughtful design. The creator is Vianka Perez Belyea, who was underwhelmed by the baby-proofing products available when her infant daughter Soledad (now 3) started crawling. Vianka teamed with Tavinder Phull, and the two co-founded Rhoost to create their own functional, stylish baby-proofing solutions. 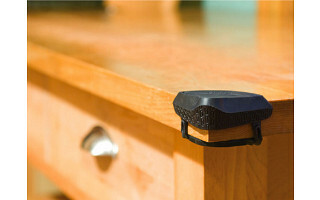 Rhoost’s Decoy outlet covers do their job keeping little fingers away from electrical outlets. Plus they have a notched groove on the back that’s just the right size for the prong of a plug. You slip the prong into the recess, twist, and the plug cover pops off. Presto, no ruined fingernails. We also love that there are no screws required for Rhoost’s Sling cabinet locks and no adhesives used with its impact-absorbing Edge corner protectors, so your cabinets and furniture won’t suffer any long-term baby-proofing damage.